There are all kinds of reasons that you might want to record a conversation. 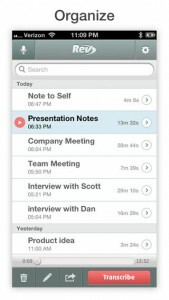 You might need to record the minutes of a meeting, or a conversation with an important client. You might want to have a record of a lecture to refer to it later, or maybe your job involves a lot of interviewing. It is hard, sometimes, to find a voice recorder app that can do all of these things equally well. Not all voice recorder apps are created equal, after all. If you’re looking for a recorder that allows for easy transcription, for example, you might want to try out Rev Voice Recorder: Dictation and Audio Transcription, developed by Rev. Rev Voice Recorder: Dictation and Audio Transcription is pretty much what it says on the tin: a voice recorder app for iOS that supports transcription of your audio files and plays nice with a variety of cloud services. The thing that I loved best about Rev Voice Recorder: Dictation and Audio Transcription is that it allowed me to keep recording, even with other apps running in the foreground. My current iPhone voice recording app doesn’t allow me to do this, much to my constant consternation! 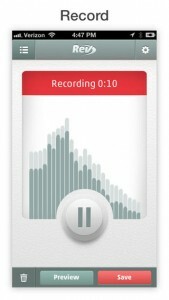 Tons of awesome features aside, what what captivates me about Rev Voice Recorder is the interface. It’s rare to find an app that’s quite this polished looking, particularly for something that’s still on Version 1.x. This app is beautiful, stable, and a dream to navigate. If you’re thinking about downloading this app, it’s probably because you have some need of transcription services. The App Store description boasts of “98%+ accuracy and 48-hour turnaround” for the transcriptions, which are written up by humans and not voice-recognition software. Pricing is $1/minute of audio. New customers can get $10 off their first order. There are tons of voice recorder apps out there. But for someone who routinely needs their notes and conversations typed up for them, the dictation services offered by this app makes it the best choice for a certain group of professionals. Boasting a great design and helpful customer support staff, this is an excellent little app. Supported OS: Requires iOS 5.0 or later.